Same Great Product and Ingredients – Now In New Packaging and Heart Shaped! 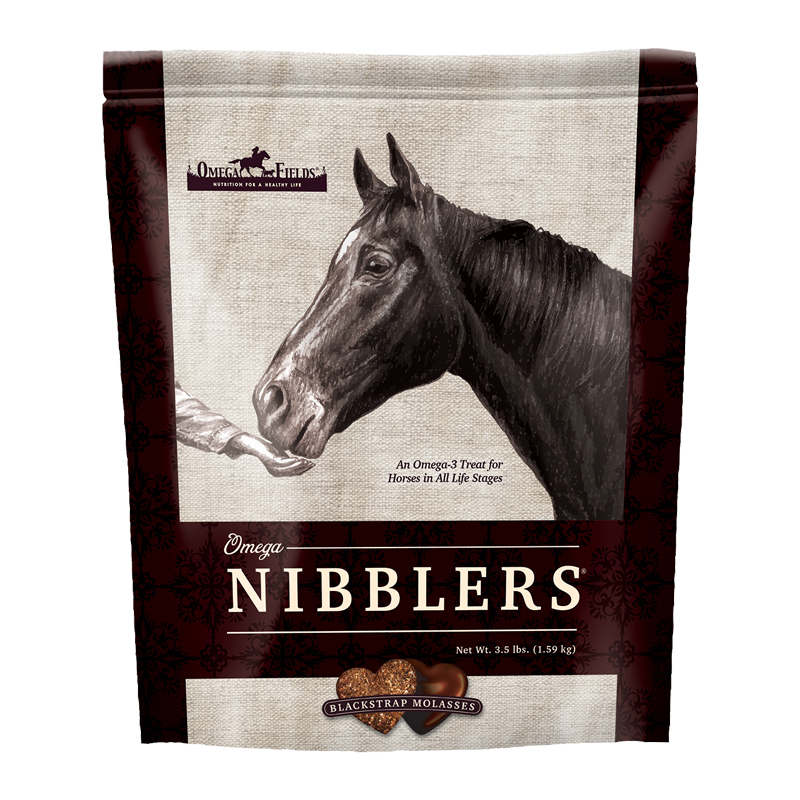 Omega Nibblers® are tasty, nutritious, and functional – the perfect Omega-3 treat/supplement for horses in all life stages. Made from stabilized fortified ground flaxseed and natural ingredients that taste great – a worthy treat for your horse! Your horse is your partner, in sport, in leisure and just in life. To keep him at his peak performance and optimal health, a solid nutritional foundation is key. Ideally, horses are able to graze fresh, growing grasses which most closely mimics their natural diet. But that may not always be possible and we may need to supply some of the missing ingredients in today’s diets and provide more functional foods. One component of a horse’s diet that is often underfed are the omega three fatty acids. While more prevalent in fresh forages, harvested forages are lower in omega three fatty acids due to their more advanced maturity. Obviously grasses and legumes have to grow to a sufficient height in order to be harvested while foraging patterns of horses show great preference for shorter, less mature plants. So why omega three’s? These fatty acids are precursors to some very essential components of the horse’s body including hormones that are responsible for gut health, blood flow and more. In the modern horse diet, they may be out of balance in comparison to omega 6 fatty acids that are more prevalent in cereal grains or other oils. An imbalance of omega 6 to omega three may lead the horse to experience more inflammation, chronic pain and allergan responses. Many horseman are looking for a more natural alternative to pain relief, or even prevention than just pharmaceutical intervention. Supplementing omega 3’s can help replace the pro-inflammatory omega 6 fatty acids in your horse’s tissues. Less inflammation with just the normal wear and tear of life can mean a happier, more functional horse. GREAT AS AN OMEGA-3 SUPPLEMENT FOR YOUR “PICKY EATERS”! Feed Omega Nibblers® as desired for training, trail riding or as a nutritious anytime treat. Feed 15 Omega Nibblers® treats per day as a tasty alternative to 1/2 cup Omega Horseshine® for a 1,200 pound horse. Omega Nibblers® were formulated by our biochemist in consultation with several veterinarians to help maintain the health of your horse. Omega Nibblers® are a great tasting and functional treat containing the best ratios of the full spectrum of natural Omega EFAs – higher in 3 & 9, lower in 6. You can have confidence in the Premium, Human-Grade, Non-GMO, 99.9% Pure, Stabilized, Ground, Fortified Flax we use in our Omega Nibblers® formula. PureGlean stabilization technology provides a stable, ground, fortified flaxseed composition as a rich source of Omega-3 in the diet. Although Omega Nibblers® treats are a super source of Omega-3s and plant and vitamin based antioxidants — we know they would test high in NSC (non structural carbohydrates) for starch and sugar because of the oats, ground grain sorghum, and blackstrap molasses in the recipe. Therefore, Omega Nibblers® are not recommended for IR or Cushings horses.However, Omega Horseshine® is recommended as an effective Omega-3 supplement for Cushings and IR horses. Omega Horseshine®, has a very low 4.4% NSC value (as sampled basis) coming from 0.6% Starch and 3.8% Sugar and is recommended as a safe source of essential Omega-3 for IR/Cushings horses. It is true that the Omega 3 in flax substitutes for what a horse on a dry lot is missing in not being on pasture. Please see more information below.As a suggestion for a very basic treat — we have a customer who told us he mixes the 1/2 cup Omega Horseshine® with just enough water to have it stick together and hand feeds it to his horse — and his horse thinks it is a big old treat! We’ve shared his comment with many of our customers who’ve told us they’ve tried it and their horses liked it too! Many equine natural-nutrition experts recommend horses should eat fats in amounts and types that mimic their ancestral diet. The natural equine diet of fresh grasses is extremely low in fat, with the naturally occurring fat predominantly Omega-3 Essential Fatty Acid. The Omega-3 and Omega-6 essential fatty acid levels in fresh grasses are at 4:1 (Omega-3 to Omega-6). Ground flax seed has Omega-3 and Omega-6 levels that are the closest to fresh grasses. The Omega-3 and Omega-6 levels in flax seed run at least 4:1, often even higher. This group is co-owned and moderated by Dr. Eleanor Kellon (V.M.D.) – Equine Nutritional Solutions (www.drkellon.com) – world renowned and respected equine veterinarian, researcher, and acclaimed author. When you join the group (no cost or obligation), you will be able to access their tremendous files section. It holds a plethora of information. Omega Fields - Linda and Pat Parelli - 1st supplement I felt really excited about! Feeding Directions: Feed as desired while training, performing, trail riding, or as a nutritious anytime treat. Feed 15 treats per day when using as an Omega-3 supplement for a 1200 pound horse. Start gradually the first week, then increase to full amount. The stabilized, ground, fortified flax seed used in Omega Nibblers® utilizes PureGlean stabilization technology. The powerful nutrients in Omega Nibblers® are locked in and guaranteed stable for at least 18 months with no signs of rancidity or loss of nutritional value. Best if stored in a cool, dry place. I was just wondering if you have any experience with your product making horses “hot?” My barn manager insists that feeding the omega acid supplement that horses, especially thoroughbreds (TB), become unruly and hard to handle because of the energy level that it causes. Has this been your experience with TB’s? If you could get back to me I would appreciate it. I have a TB with terrible hooves. I am constantly fighting whiteline disease and thrush and I was hoping to buy a product that would benefit his hooves and his skin and joints. Since Omega-3 essential fatty acids are utilized by the body so effectively (they are the first fats used at the cellular level), they do not normally cause a horse to get hot or cause excess energy — as other fats or calories can do. Please see section below explaining how Omega-3 fats are so essential to your TB’s good health (at the most basic cellular level) and why they are the first fats utilized by the body . Omega-3 essential fatty acids are necessary for cell membrane integrity. Cell membrane integrity can be compromised by excess acidity at the cellular levels and by too high levels of pro-inflammatory fatty acids like Omega-6 — which the animal takes in from feeds and grains, and trans fats and animal fat products which may be present in senior feeds, et. If those cell membranes become deformed, they cannot facilitate the elimination of metabolic wastes nor can they allow entry to the cell of nutrients. The cell membrane also is important in healthy energy production … the electrolytes of magnesium and potassium inside the cell interact across the cell membrane with the electrolytes sodium and calcium in the fluid outside the cell to produce electrical energy. If the membrane is damaged from a deficiency of Omega-3, calcium and sodium rush into the cell and shut down the life forces of that cell. 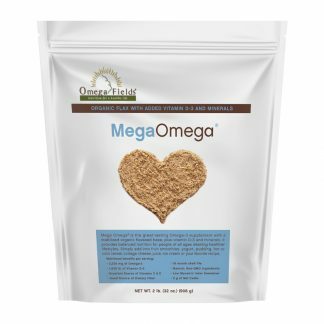 The stabilized ground flax seed used in Omega Fields’ products is very high in Omega-3 essential fatty acids. Flax seed is the richest source of Omega-3 in the plant world — 4 parts of Omega-3 to 1 part of Omega-6 (4:1 ratio) — the same ratio as the fat found in fresh natural grasses (forage). 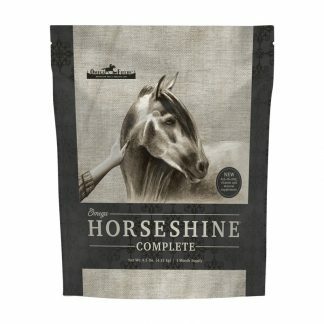 This makes it ideal because it is heavily tipped in favor of the Omega-3s your horse’s diet is missing — which also provide “benefits” of beautiful bloom, soft smooth skin, strong solid hoof growth, prevention of inflammatory problems from bug bites/allergies, and relief from arthritic pain. The stabilized ground flaxseed in Omega Horseshine and Omega Nibblers also acts as a digestive aid to buffer excess acid and aids in the stabilization and modulation of blood glucose. Therefore, it can help a thin horse keep on weight — by helping the horse absorb more nutritional value from its dietary intake. Omega-3 fatty acids also do not normally get stored as fat so they will not put excess weight on an easy keeper. When the body has proper functional nutrition, in the right balance — the level of cell membrane integrity improves — thus improving the level of optimal health. Please keep in mind that these are only our feeding suggestions or recommendations. We believe it is always advisable to check with your equine nutritionist or your veterinarian concerning dietary changes you are considering for your horses. How many mg of Omega 3 and Omega 6 fatty acids are in 15 Omega Nibblers? There are approximately 10,260 mg of Omega-3 and 3,420 mg of Omega-6 in 15 Omega Nibblers treats. Do your Omega Nibblers treats contain added sugar or molasses? Do you know the sugar and/or starch analysis? Omega Nibblers treats do contain black strap molasses, but only at less than 3%. We intentionally improved Omega Nibblers by replacing the cane molasses in the previous recipe with blackstrap molasses, which is considered superior in nutritional content, and may be especially touted as a healthy food (for pets and their people!). Although we have not had them tested by Dairy One, we know they would test high in NSC (non structural carbohydrates) for starch and sugar because of the oats, rice bran, and molasses in the recipe. Omega Nibblers are not recommended for IR or Cushings horses as the NSC amount would be over the recommendation of 10% or less. We are very pleased, however, that our supplement Omega Horseshine’s stabilized ground flax seed has a low NSC value (4.4%) and, as such, has been recommended as a safe source of essential Omega-3 for IR/Cushings horses. As a suggestion for a very basic treat — I have a customer who told me he mixes the 1/2 cup Omega Horseshine® with just enough water to have it stick together and hand feeds it to his horse — and his horse thinks it is a big old treat! I’ve shared his comment with many of our customers who’ve told me they’ve tried it and their horses liked it too. My girlfriend feeds your Omega-3 Nibblers to her horse and she swears by them. I'm thinking getting some for my horse, but I'm wondering about the benefit/safety of the yeast culture. Would you please explain why horses need additional yeast culture? Thank you! We are pleased to let you know that Omega Nibblers® do contain Diamond V Yeast as a probiotic — please see a bit more in-depth information below. Omega Nibblers are tasty and functional — it’s a win/win treat! 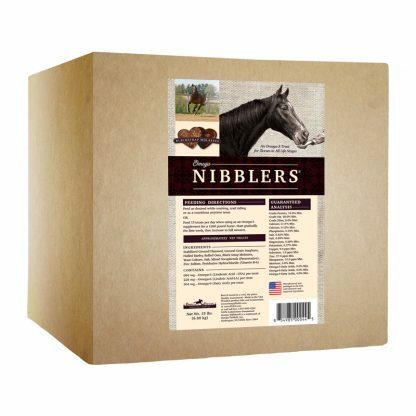 Omega Nibblers were formulated by our biochemist in consultation with several veterinarians to help maintain the health of your horse. 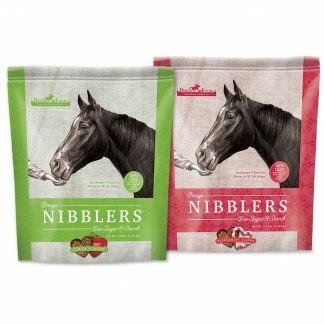 Omega Nibblers are a great tasting and functional treat containing the best ratios of the full spectrum of natural Omega EFAs — higher in 3 and 9 and lower in 6 — to complement your horse’s health. The ground flaxseed in the treats also acts as a digestive aid. Ingredients include: stabilized ground flaxseed (at 50% of the formula! ), ground grain sorghum seed, hulled barley, rolled oats, black strap molasses, Diamond V Yeast as a probiotic, salt, mixed tocopherols as a natural preservative, zinc sulfate, and vitamin B-6. One of the most noted responses of yeast culture inclusion in horse diets is the positive impact on hindgut fermentation of fiber (cellulose and hemicellulose conversion to volatile fatty acids) which leads to better forage utilization and more energy production. Diets containing a performance-proven yeast culture are digested more completely, which positively affects the efficiency of forage utilization and horse performance. Yeast cultures have also improved nitrogen digestibility (better protein usage from forage) and digestibility of some minerals. The use of yeast culture has also been shown to influence the level of plasma lactic acid in exercising horses. Lower levels of plasma lactic acid were produced in exercising horses fed yeast culture compared to control (no yeast culture) horses. Horses with lower lactic acid levels are capable of working longer and recovering quicker and have less risk of typing-up. We’ve selected the most effective yeast culture we could find on the market — Diamond V Yeast XP — for our Omega Nibblers® formula. The Diamond V Process™ used to manufacture yeast culture creates nutritional metabolites. A true yeast culture is an all-natural product derived from culturing Saccharomyces cerevisiae (yeast). During the culturing process, yeast produce nutritional metabolites which are products of yeast metabolic processes. These nutritional metabolites increase the fermenting activity of hindgut bacteria, enabling them to more completely break down the feed, providing the horse with additional nutrients for absorption. Digestion studies have shown Diamond V Yeast Culture increases fiber digestibility in the horse. 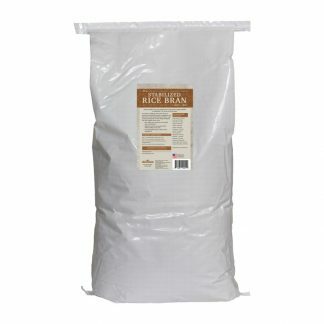 Therefore, nutrients in hay and feed are more available for use by the horse. By increasing the digestibility of fibrous feedstuffs, more energy is made available for growth, maintenance, or other activities. A study conducted by Glade and Campbell-Taylor (1990) showed that Diamond V Yeast Culture supplemented horses had heart rates of 99 beats per minute versus 120 beats per minute for control horses after 35 minutes of exercise. In addition to heart rate, when looking at the equine athlete, one of the other key factors is lactic acid build-up in the muscles. This build-up causes our horses the pain and soreness that sometimes require a long recovery period, depending on the exercise levels. In any event, it is beneficial to reduce this lactic acid build-up and improve recovery time. Diamond V Yeast Culture was shown in a study by Glade and Campbell-Taylor (1990) to effect lactic acid accumulation in the blood. All horses can benefit from yeast culture supplementation. The level of response is dependent on forage quality and class of horse. Young horses, working horses, and broodmares in late gestation and early lactation particularly benefit from yeast culture supplementation. Yeast culture supplementation may also be beneficial to older horses, since they cannot digest protein, phosphorus, and fiber as efficiently as younger horses. Yeast culture seems to be especially valuable when forage quality is less than optimum, regardless of the class of horse being fed. Injured horses and horses recovering from illness also benefit from supplementation. Will Nibblers work as well as Horseshine for Sand Colic? Fifteen each Omega Nibblers contains the same amount of flax as does a 1/2 cup serving of Omega Horseshine. Therefore, as long as fifteen each Omega Nibblers are fed per day, that daily serving size will help prevent sand colic. How many Omega Nibblers are in the 3.5 lb pouch? There are approximately 215 treats in each pouch. Have a big herd of horses? Keep in mind that we also have a huge 15 lb box of Omega Nibblers with approximately 925 treats! WOW! How many of the Nibblers would a 1000-1200 lbs horse need daily vs. the Omega Horseshine powder? Omega Nibblers (the horse treats made with the highest percentage of flax) are the most convenient and enjoyable way our customers have found to supplement their horses with the benefits of Omega-3 / fiber. Just 15 treats per day for a 1200 pound horse is the recommended amount to take the place of 1/2 cup of Omega Horseshine as a daily Omega-3 supplement. I have a question. 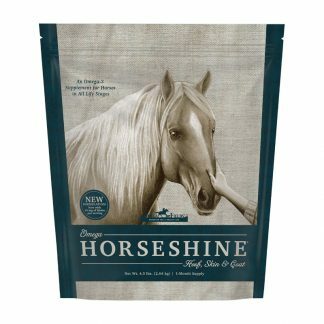 My horse was just diagnosed with acute laminitis and was wondering if any of your treats would benefit for him. He is on a strict diet and needs to lose weight. We would recommend either Omega Nibblers treats and/or Omega Fields’ stabilized ground flax supplement, Omega Horseshine® — as a smart investment for the health of your horse. Please keep reading for more in-depth information. 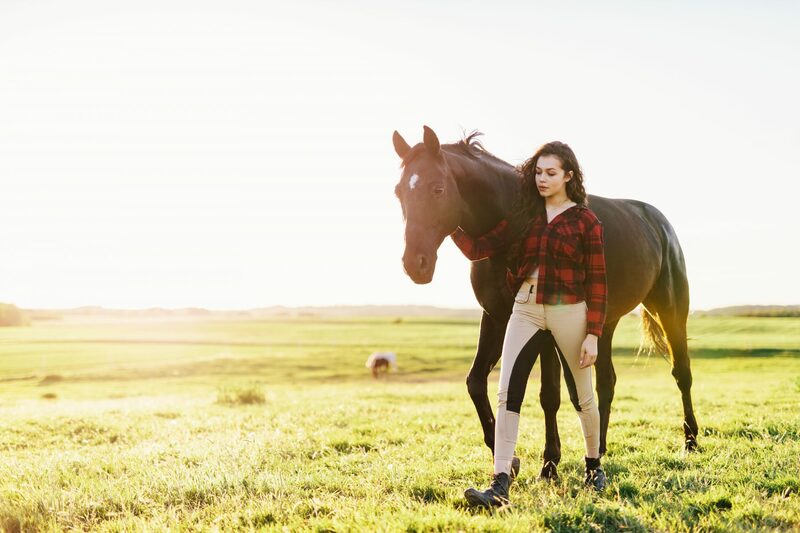 Why is supplementing with Omega-3 essential fatty acids (Omega Nibblers® and/or Omega Horseshine® are both rich sources of Omega-3) important to cellular health to help prevent/alleviate problems with laminitis? The membrane, or outer coating, of every one of the billions of cells in the body are unusually rich in Omega-3 fatty acids. In fact Omega-3 fatty acids are the structural fat that makes up this membrane and play a vital role in how cells function. To understand how Omega Nibblers and/or Omega Horseshine (as a rich source of stabilized Omega-3 essential fatty acids) helps improve a horse’s quality of life, let’s take a look at how cells behave when they are aging and/or damaged by trauma such as disease (ie – laminitis/navicular/founder), injury, surgery, or over-training. When a cell is irritated or damaged, or when it begins to age, its membranes break down. As a result, compounds contained within the cell walls are released into the cell matrix. Some of these substances, such as histamine, give rise to inflammation and associated pain. Inflammation is characterized by redness, swelling, heat and moderate to intense discomfort. Your horse may experience any or all of these symptoms. This can prevent the horse from moving properly, leading to stiffness and loss of function. Researchers have found that the “diseases of aging” in horses such as laminitis, navicular, founder, and arthritis have similar underlying factors: a decrease in cell stability leading to membrane damage and subsequent release of compounds that promote damage, spasm and inflammation. The Omega-3 essential fatty acids in Omega Nibblers and/or Omega Horseshine work by stabilizing the membranes of the cells, promoting healing of existing damage and helping to prevent further damage. On a practical level, this means quality of life is improved, and you will see your horse experiencing the freedom to move. Also, horses with weak/poor hoof conformation are more apt to suffer with laminitis. Poor hoof growth may be a sign of Omega-3 deficiency. Omega Nibblers and/or Omega Horseshine provide highest levels of Omega-3 – both are an excellent choice for helping create healthy strong thick-walled hoof growth without cracks. Strong thick-walled hooves will be a most effective preventative for the problems of navicular. Based on our customers’ comments on the results they’ve seen (over these past 25 years) — they were able to cut way back on or discontinue additional hoof supplements altogether – because of the high percentage of Omega-3 in Omega Nibblers and/or Omega Horseshine. Omega Horseshine is actually recommended as an effective Omega-3 supplement for Cushings and IR horses because of its low 4.4% Non Structural Carbohydrate (NSC) value. Please see more information below. Many equine natural-nutrition experts recommend horses should eat fats in amounts and types that mimic their ancestral diet. The natural equine diet of fresh grasses is extremely low in fat, with the naturally occurring fat predominantly Omega-3 Essential Fatty Acid. The Omega-3 and Omega-6 essential fatty acid levels in fresh grasses are at 3:1 (Omega-3 to Omega-6). Ground flax seed has Omega-3 and Omega-6 levels that are the closest to fresh grasses. The Omega-3 and Omega-6 levels in flax seed run at least 3:1, often even higher. Omega Horseshine contains 30% crude fat and has a 39% carbohydrate level with a very low NSC level of 4.4% (Starch .6% and Sugar 3.8%). It is one of the safest and most natural ways to supplement the healthy Omega-3 fat in animals — which provides side “benefits” of beautiful bloom, soft smooth skin, strong solid hoof growth, prevention of inflammatory problems from bug bites/allergies, relief from arthritic pain. and sufficient Omega-3 for pregnant mares. The Omega Nibblers’ formula does contain black strap molasses (although the inclusion level is less than 5%!) – so they do have a higher level of NSC than Omega Horseshine …. but .. that is really only a concern if your horse is metabolically challenged. Please keep in mind that these are only our suggestions or recommendations. 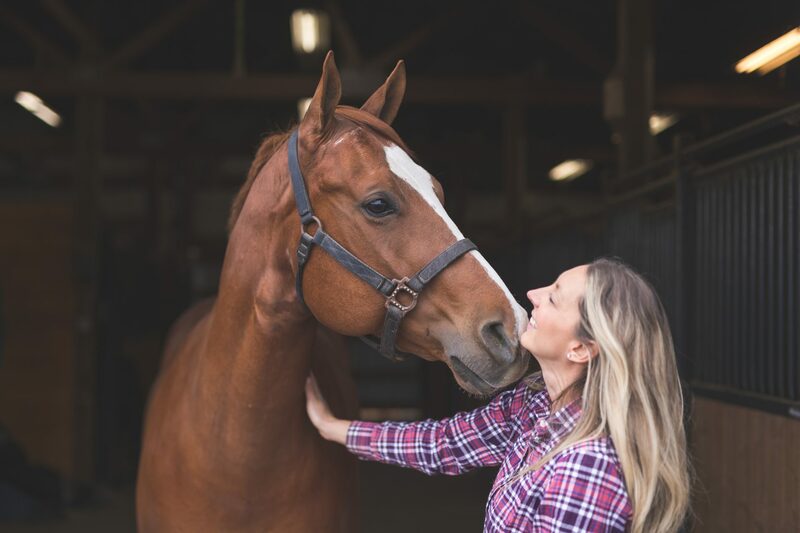 We believe it is always advisable to check with your equine nutritionist or your veterinarian concerning dietary changes you are considering or health questions you have concerning your horses. My horses absolutely love these! They would eat them all the time if I’d let em’. It has made their coats shine, and their look sooo much healthier! Omega Nibblers are great! my horses love them. We never have any problems with their hooves, and their coats look amazing! We’ve tried a number of other supplements and none compare to Omega Nibblers. He sheds out better in spring, looks shiny even when dirty, great hooves plus a long, beautiful mane and tail. Every feeding he pushes his Nibblers to the side, eats his grain then savors his “cookies” for dessert. Never seen a horse enjoy his supplement so much. We love Omega Nibblers! My horses choose these treats over any others! And the health benefits make me happy as well. Thanks, Omega Fields! Our horses hooves used to crack all the time, since we’ve started giving them Omega Nibblers they’re really starting to look better. Great Product! My horse is 34 years old and has trouble eating other horse treats & even carrots. I’ve tried other flax-based cookies, but they are all too hard for him to crunch up. He loves the Omega Nibblers & it’s nice to be able to hand feed him a treat like I can with the other horses.